With Lee Wilson suspended, Saints fielded a trialist goalkeeper and new assistant manager Charlie King started his first game for the club. Ross Cunningham scored after four minutes when he got on the end of a great cross from the right and his shot hit off the far post prior to rolling along the line and into the net. Stirling University were also causing problems with their pacey forwards and a shot was well saved by the home side’s goalkeeper in the eighth minute. It was then the turn of the Saints’ Jack Wilson to have a pop when his shot went past the post, before an attack from Stirling down the left nearly produced a goal but the danger was cleared after an almighty scramble on the Saints’ goal line. 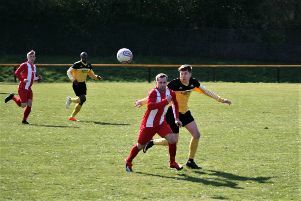 A cross from Jack Blaney moments later threatened the away goal but it was just too deep for the St Andrews United forwards to attack. Saints were having a lot of the play as another attack produced a great save from the Stirling keeper but Tabs Sweeney replaced Drew Fleming after the latter took a knock. Stirling subsequently produced a bit more pressure on the home goal after being given too much room by the Saints’ defence but a shot went over the bar. While another attack was deemed to be offside with only the young Saints goalie to beat. Then it was Saints turn to have a go at the visitors’ goal but Wilson’s shot was placed wide of the target when it looked easier to score. Saints had the ball in the net on the stroke of half time but that effort was ruled out for offside. After the restart, St Andrews went two up through Wilson. Goal number three came when Paul Quinn converted a corner from Ryan McInnes. Some good play from the students then put Saints under pressure for a period, which led to Blaney putting through his own goal. Saints wrapped up the points when Charlie King hit a long range shot just as the Stirling goalkeeper was distracted by Sweeney and the ball crept in at the far post.